Who Wants to be a Millionaire?.. Who Wants To Be a Millionaire.. Product weight is 0.18 lbs. Challenge your own score in this intense brain challenge and complete various achievements to unlock new customization options for your avatar. With 3000 questions the game offers 20 plus hours of gameplay For the first time ever, compete with your friends in Party Mode! Up to 4 players can play simultaneously Create a fully customized avatar including body, hair, face, clothing and more! New customization options become available as you play the game. Unlock bonus items as a reward for progress in the game. Who Wants To Be A Millionaire is based on the wildly popular and Emmy-awarding winning TV game show of the same name that debuted in 1999 and has been in U.S. daily syndication since September 2002. “Is that your final answer?” has become a popular catch phrase in popular vocabulary. 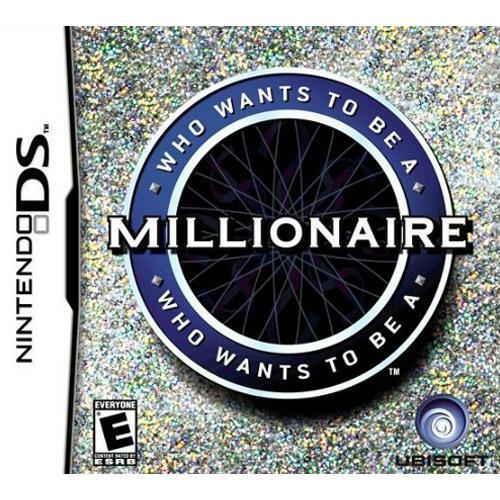 You take the hot seat in the all new Who Wants to be a Millionaire game. Win $1,000,000 by correctly answering 15 multiple choice questions, each worth an increasing amount of money. Just like on TV, players can seek help for the super stumper questions via lifelines like “Ask the Audience”, “Double Dip” or “Phone a Friend”. Can you stand the pressure, or will you walk away?